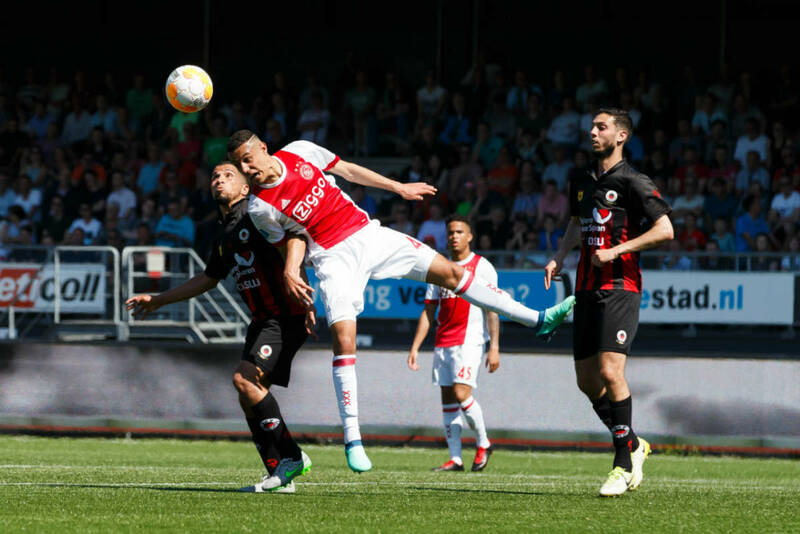 Justin Kluivert in action against Excelsior last season. Photo: VI via HH. Ajax teenager Justin Kluivert is expected to complete his transfer to Italian club AS Roma after completing a medical on Tuesday. The 19-year-old flew in to Fiumicino airport on Monday night sporting a Roma scarf in anticipation of the move, for a reported fee of €17.5 million. English club Manchester United had also reportedly been chasing his signature. The club are also in talks with Ajax’s player of the season Hakim Ziyech. The 25-year-old midfielder, who is in Morocco’s World Cup squad, told AD last month that there was ‘zero chance’ he would still be in Amsterdam next season. ‘I just feel I need a trigger in a different environment,’ he said. Kluivert, whose father Patrick is the national team’s all-time top scorer, played 30 games for the Amsterdam club last season, scoring 10 goals, and won his first international cap in March. His team-mates at Roma will include fellow Netherlands internationals Kevin Strootman and Rick Karsdorp.